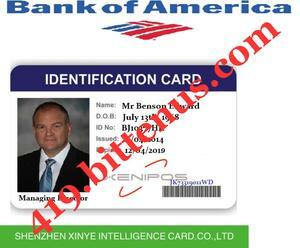 Following the instruction given by the United States Financial DEASPORAL/IMF, your funds of $11.9 Million Dollars has been officially signed after they have gone through your master card and confirmed your funds legitimate. Our agents shall be coming to your home address as stated in your clearance certificate with your parcel which contains your ATM Master Card. According to the certificate you are requested to send us your full name, address and telephone number before releasing the legal documents backing up your funds. We shall attach your clearance certificate immediately as soon as we confirm your name, address and Telephone no. A copy of my working ID affixed for your legal perusal. Bank Of America, North Carolina, United States. Subject: FROM THE BANK OF AMERICA, UNITED STATES. We write to officially inform you that your information have been received and with your details we have in our system, the both corresponds showing that you are the true beneficiary of this ATM Master card. Our two agents shall commence your delivery to your home address as stated to to us without any further delays. Your four (4) digits security pin will be sent to you as soon as we confirm that you have personally receive your ATM Master Card for security reasons. You are requested to send the delivery fees of $298.00 dollars before we commence the delivery of your ATM Master card. Attached is your clearance certificate which must be kept safe for reference purpose. Awaiting your quick response to send you the payment information. 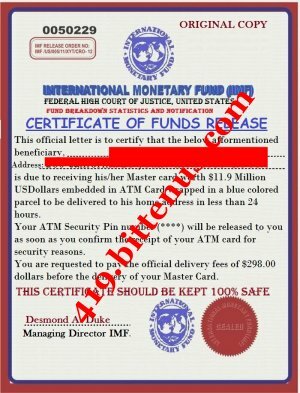 Following the instruction given by the United States Financial DEASPORAL/IMF, your funds of $11.9 Million Dollars has been officially signed for release after going through your file and confirmed your funds legitimate. Your said compensation funds has been embedded in ATM Master Card to be delivered to your home address by our agents. According to the instruction you are requested to send us your full name, address and telephone number before releasing the legal documents backing up your funds. A copy of my working ID affixed for your perusal.